Transforms from a regular flashlight, to clamp light, to stand light providing light where you need it and freeing up two hands to work. 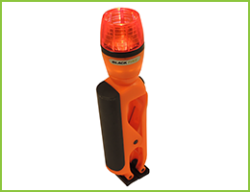 The snap on emergency beacon combined with the strobe light turns the Clamplight® Emergency into a roadside flare. Strobe mode - can be put on a roadway or attached to a vehicle for added visibility in an emergency. Replaces safety flares. Double axis pivot adjusts to infinite angles - delivers brilliant white light where you need it. Engineered with High Performance Plastics to be lightweight yet tough. Extremely tough polycarbonate lens resists cracking or scratching. Stainless steel springs and pins for added durability. Uses a 1 watt CREE® brilliant white LED. Bulb life is virtually forever at 100,000 hours. Up to 100 lumens of light. Battery Life - 26 hours - max output 7 hours Shaped like a traditional flashlight for easy portability or to fit in a belt or pocket. Great for roadside emergencies, camping, and home preparedness kits.